Christian Pulisic (r.) was one of four Bundesliga players to feature for the USA in a friendly win over Ecuador in Texas on Wednesday. 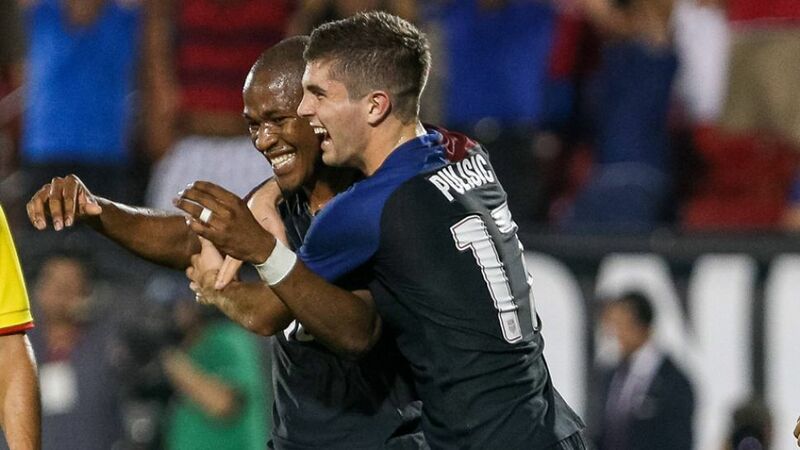 Bundesliga quartet Christian Pulisic, Fabian Johnson, Bobby Wood and John Anthony Brooks all featured as the USA defeated Ecuador 1-0 in a pre-Copa America Centenario friendly. Borussia Mönchengladbach man Johnson played the full 90 minutes of the game in Texas while Hertha Berlin defender Brooks also started. Borussia Dortmund prodigy Pulisic came off the bench shortly after the hour mark, and contributed to upping the hosts' tempo as freshly-signed Hamburger SV forward Wood, who was brought on at half-time, provided the cross for Darlington Nagbe to score his maiden senior international goal in the 90th-minute. Jürgen Klinsmann's men now face Bolivia in Kansas City in their final warm-up game on Saturday before opening the Copa group-stage campaign against Colombia in Santa Clara, California, on 3 June.